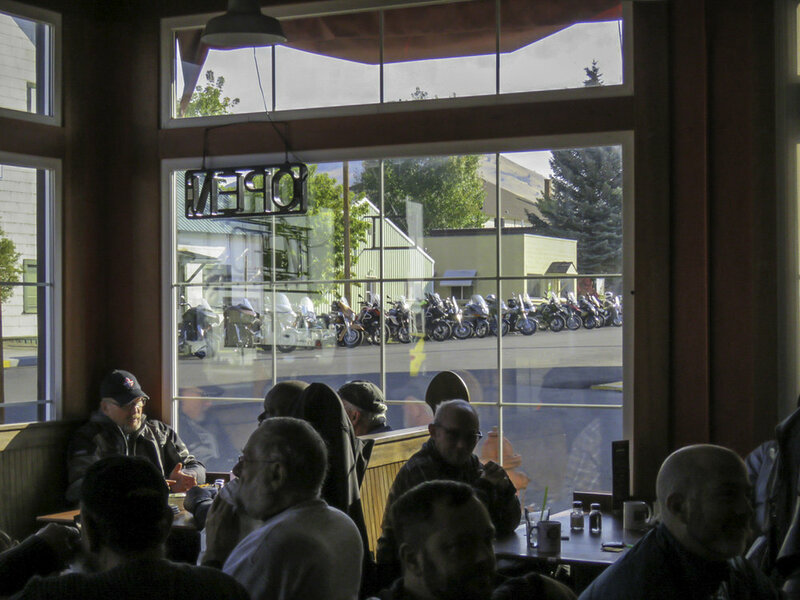 The Border Riders Motorcycle Club (BRMC) is an organized group of guys who like to ride and camp. Our membership spans the Pacific Northwest, with the greatest participation in Portland, Seattle, and Vancouver B.C. We have one of the largest memberships of gay clubs in North America, and welcome like-minded guests to join us on our monthly club events and local activities during the riding months. Check the main page of the website at http://borderriders.com for additional information. The October meeting will be hosted by Doug H in Surrey, B.C. Social time will be at 4, meeting at 5, dinner at 6. Cost is $15 American, Canadian rate adjusted per normal. As always, registration via the website. Bear Hollow, one of our favorite camp sites, was our last riding/camp run for the season. We were graced that the weather was outstanding, yet that distinct feeling of crisp Fall in the air… warm during the day, and chilly at night (note to self, next time remember to swap out the summer sleeping bag for the winter bag). Again, this year, we had the entire camp to ourselves to enjoy. Most guys arrived by Friday evening and, after setting up camp, headed back into Fossil for dinner. Back at camp, while no open camp fires were allowed, we were permitted to use our portable propane campfire to huddle around and catch up on all the ongoings of everyone. Breakfast the next morning was to be in Fossil by special arrangement. Fossil, being a one horse town, didn’t have a place for us to eat that would be open. The great guys at Cross Rifle opened just for us and served a limited menu that couldn’t be beat. We did put their coffee pot to the limits. The town being relatively quiet in the morning, we were, in a rare instance, able to park all our bikes in a row along the street for a great photo. Day riders were off in all cardinal directions. Several of the guys now have dual-tracks, so a little off-asphalt riding was in order. The weather was great for everyone, even those who hung around camp and visited Fossil for ice-cream and pizza. Returning later in the afternoon, we held a club meeting and group photo before heading off for dinner at Service Creek. Service Creek, and Kelly’s Stagestop, is the only place for miles around in all directions. It sits at the junction of roads that lead back to Fossil, down to Mitchell, and over to John Day. Of note for us, they typically do not do dinner, but being accommodating folks, they opened just for us and prepared a tri-tip special that was out of this world. Randy, our host, treated us to extra portions, and even spread it around to other guys who hadn’t ordered it. Apparently, there was to be no leftovers. As a special, he gave us the history of the place dating back to the settler era. On full tummies, and bikes loaded with a variety of flavored popcorn bags that Randy had given us, we headed back to camp, now dark. We enjoyed a nice, and slightly warmer evening, around the propane fire, and turned into bed for another chilly night. The next morning was fresh and crisp in the Fall air, as we packed up and said our good-byes to head off to all parts from which we came. The entrance sign into the campground. Bikes and tents filling the campground. Drone’s-eye view of some of the bikes at camp. Line-up for breakfast. Not much going on in fossil on a Saturday morning, so we got the whole street to park our bikes. A big shout-out for Cross-RIfle, who opened just for us at breakfast. Gas-up time for a day ride. Stations are few and far between in this part of the state. A personal bucket item for our guest, Cas, as he hits the 45th. With the advent of dual tracks, a pack of riders on an adventure off the asphalt. The summer is now over and back to the rainy season. The number of riding days will be limited. Some of you have already parked your bikes for the winter and others of us will continue riding as the weather allows. The run to Bear Hollow outside Fossil was a good run. We had 23 members and guests present. I met up with Dennis H and Dale C in Enumclaw for breakfast. I had rain off and on from my house to Auburn and traffic was a parking lot on I-405 for much of the way. After breakfast we headed over Chinook Pass and stopped for gas in Naches. At our next gas stop in Biggs, OR John D got up with us. He had spent the night in the tri-cities area and rode the remainder of the way with us. The weather during the day was great for hanging out at camp on Saturday. The evenings were on the cold side. I rode back with Chris L and Richard A. We had high winds between Condon and Biggs. There were times I thought we were going to be blown off the road. After breakfast with Stan C, Alan H and Kas C, the three us headed north on 97 to I-82 onto I-90 at Ellensburg. At North Bend we ran into heavy rain and had rain much of the way home. The following weekend on Sunday I went to the Oyster run with some friends. We left my house at 9:00 and arrived in Anacortes before the bike traffic was too heavy. We parked our bikes in the middle of the Commercial Ave by 6th St. Before we left the remainder of Commercial Ave down to the wharf was filled with bikes as were many of the side streets. We watched the Seattle Cassocks perform on their vintage Harleys. It was a fun show to watch. I sure don’t have the balance that those guys do. After wandering around and doing a bit of shopping we headed out of town about 1:30. Again we beat the rush of bikers leaving. It was a nice warm day to enjoy thousands of bikes. I hope to see you at our meeting up in Surrey BC on October 20th. Keep the shiny side up! The monthly recap summarized the trip to Fossil very well with great day rides by all, though no one rode to Hardman this year. Two points would like to expound on: 1) A 35 degree rated sleeping bag just means you won’t die of hypothermia in your sleep, not that you will be comfortable; and 2) Small towns like Fossil and like we saw in Kettle Falls may not have a lot to offer, but the people go out of their way to serve us as it is their own business, not just a paycheck. June – Oregon, not too far from Portland to enable us to do Pride again. I hope the campground will be Bear Springs near Maupin. July – Eastern Washington, hoping to be Lewis and Clark Trail State Park near Dayton. August – British Columbia, yet to be determined. September – bye month for run, the week-long anniversary trip being held instead. The campground reservations vary as far as the windows for booking, will firm them up as available, but at least the general locations are planned. This month I will talk briefly talk about a letter we got from the IRS, club finances, the Fossil Campout, Alan and my trip to Atlanta, and Portland’s Meet & Greet “M&G”. We recently received a letter from the IRS telling us that they received our request for Not For Profit “NFP” Status and they said the application appeared complete. They will process our NFP request and we should hear from them soon. Soon for the IRS could be months so we are back to the waiting game. Speaking of the last campout of the year, it was a blast. I didn’t say it was warm, I said it was a blast. A winter blast perhaps, but a blast. Seriously, I had a wonderful time and got to do a day ride with several very talented riders. To those who rode with me to the Painted Hills and to Fossil for lunch, I hope you had at least ½ as much fun as I did. Thank you! To those of you who lost your toes to frost bite, so sorry. When we got home I learned that Alan was taking the hot water we had for coffee and was spilling it on his boots to keep his feet warm. I think I might need to bring a bigger pot for boiling water and a container for us to take turn standing in. This is also a reminder to make sure your riding boots are water proofed and ready for winter. I must say that I find October to be one of the more depressing months of the year. It the season that signals an end to riding season 6 months of grey. I hate riding in the rain. Mostly because it takes so dang long to get the bike to shine again. Speaking of shine again, it took me 5 hours to wash Alan and my bike after our trip. Between the bugs and the rain there wasn’t a clean spot on either bike. Our plan was to ride to Atlanta in 4 or 5 days, visit friends for 3 or 4 days, ride to Branson, MO in 1 day, visit with Alan’s family for 2 days, ride to Bend in 3 days to pick up our camping gear, go camping for a couple days and ride home. The first day went perfectly. We rode from Portland to Burly ID, got checked into the hotel and went out for wonderful Mexican food. The second day we only got to Moab before running into weather warnings. After much weather research we decided to make a run for Monticello and about ½ way there it got very dark, wet and then KABOOM, lightening. A quick goodbye before turning off the communication systems and a beeline for safety. After spending an hour at the gas station in Monticello we made a run for Durango only to be stopped in Delores, KABOOM, by lightening again. This was a short break and a chance for me to put on my heated gear before making a beeline for Durango. We rode out of this storm 30 minutes later and finished the ride into Durango trouble free. The next day we had a wonderful ride to Albuquerque and a wind-blown ride to Amarillo. We started looking at the weather forecast and discovered we would be dealing with a possible hurricane the next day as we made our way into Rock Springs Arkansas. We brain stormed for several hours and decided to sit in Amarillo for a day. We decided to rent a car and do some local touring. We found Route 66 and Smokey Joe’s which was a Route 66 era BBQ joint and spent the day touring Amarillo. By mid-afternoon we realized we would not be able to make it to Atlanta and if we did there was another storm brewing that we would be dealing with when we left Atlanta. We decided we had no choice but to abort our vacation plans. Once we came to terms with this decision we headed to Denver. I have family there and we could regroup from there. We spent a wonderful afternoon and evening visiting and watching the weather forecast. Things started looking promising enough for us to make a run for Branson, so we could visit with Alan’s family. We got the oil changed in Denver that morning and heading out. It wasn’t long before we had to deal with a side wind that stayed with us all afternoon. When we check weather that night we saw another thunderstorm was moving toward Branson and we wouldn’t have enough time to beat it. We decided to stay an extra day in Selina Kansas and finish the ride to Branson the following day. If you haven’t been to the Eisenhower Presidential Library, you should. We made it to Branson the next day and had a wonderful visit with Alan’s family. We left Branson and made it the rest of the trip without lightening although we did have a side wind almost all the way back to Oregon. We meet up with Chris and Richard in Bend, went out for a wonderful dinner, picked up our camping gear, rode to the Fossil campout and had a wonderful time closing the trip on a high note. Despite all the changes it was a wonderful 2 weeks on the bike. If you have the right frame of mind, it’s just all part of the adventure. If you have ever dreamed about doing such a ride and don’t know how to start or have some questions, please contact me. You really need to get out there and see some of what this beautiful country has to offer. The final subject for my portion of this newsletter is the new location for Portland’s monthly M&G. the answer is, I don’t have one. I am a little surprised this turned out to be as difficult as it is. I had it figured out at one point then someone pointed out an issue I hadn’t noticed and I’m back to the beginning. I now have it narrowed down to a couple locations, again. with only a couple months left to the year I might just make it a new year / new location thing so stay tuned. I hope to see you all at the October meeting. It is time to begin thinking about members for the Board of Directors for 2019. Club Bylaws state nominations for club officers are to be done at the October, November and December club meetings with the elections held at the Annual General Meeting (AGM). Voting is by secret ballot with the person receiving the most votes in each position assuming office beginning at the time of Annual Banquet. Officer positions are President, Vice President, Road Captain, Secretary, and Treasurer. Please give some thought to serving as an officer of the club. New members are elected into the club in January at the Annual General Meeting. Now would be the time to nominate anyone for consideration for membership. Candidates for membership can be nominated at any business meeting of the club. The earlier in the year that a candidate for membership is nominated the more familiar existing members can become with the nominee. This year our annual Holiday Party and white elephant gift exchange will be hosted by members Chris L and Richard A at their residence north of Burlington. The date is December 8th. Watch for additional information. The annual AGM will be held on January 19th at the Cuff Complex in Seattle. This is the time to renew club dues, elect officers for the coming year as well as conduct club business. Please remember that if your eligibility to vote has lapsed that you must attend two business meetings in order to be able to vote at the AGM. If you have questions about your eligibility to vote please contact the club secretary at secretary@borderriders.com. We have 1 member with a birthday this month. Please take a moment to wish him a great day. BRMC members will be available for new and returning guys to connect and learn more about the club and opportunities to participate. If you are interested, check out when and where in the cities listed below. Also, in addition to the club's monthly events, local rides may be organized, weather permitting. To lean more, email the Road Captain for specific details, or to ensure a member to meet you, at captain@borderriders.com.